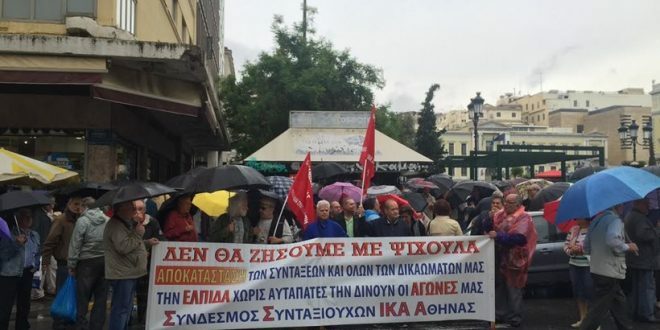 Hundreds of pensioners defied the rain and took to the streets to protest the new austerity package to be voted Thursday night at the Greek Parliament. With umbrellas and raincoats, they joined their voices to prevent more austerity measures threatening to put their survival at risk. Holding banners and chanting slogans the pensioners walked to the Parliament opposite the Syntagma Square in downtown Athens. The new austerity package foresees pension cuts totaling 1.8 billion euros as of 2019 and lowering the tax-free threshold to 5.600 euro annual income as of 2020. These two measures will hit that especially low-pensioners twice. Furthermore, cuts are foreseen also in social welfare benefits, including the scrapping of poverty allowance for the low-pensioners. “If we don’tt stop them they’ll bring pensions down to 300 euro. That was the plan form the beginning,” another pensioner said. One day after the general strike on Wednesday, public and private sector unions ADEDY and GESEE have called on a protest outside the Parliament, just hours before the voting. The protest will be joined by the Communist party KKE and left-wing parties like ANTARSYA and LAE that have not representatives in the Parliament. The anti-austerity demonstration at Syntagma is scheduled to start at 6:30 pm, Thursday, May 18 2017. The night is expected to be long, as Prime Minister Alexis Tsipras and leaders of the opposition parties will start the debate in the Parliament Plenary at 6 p.m. The voting will take place after midnight, most probably in the early hours of Friday. The omnibus bill contains more than 100 prior actions, the Greek government needs to fulfill following creditors demands. Read also KTG’s analysis: Economic Experiment ‘Greece’: Operation was successful, but the patient died.